煮炒 “tze char“ is a very common culinary concept in this part of Asia. Analogous to the makeshift stir fry and noodle stalls in Bangkok and 大排档 Dai Pai Tung in Hong Kong, the term “tze char” is a kind of street food culture unique to Singapore and Malaysia. In Singapore, the popularity of “tze char” rose gradually after the post-war years and thrived all the way up to the 1980s when these pushcart stalls could be seen in practically most living quarters as well as areas known for night entertainment like amusement parks and cinemas. With the popularising of “HDBs”, these makeshift “tze char” stall owners abandoned their practice to deck out foldable formica-plastered tables and wooden chairs for al fresco dining every evening, and of course the need to brave through bad weather, pit their wits and avoid harassment from the “teh gu” 地牛, a colloquial term for government officers in charge of raiding illegal street hawkers, not to mention the collection of “protection money” from triads who were “in charged” of the “turfs” the stalls were located in. They made their way into the heartlands, and became “anchor tenants” of kopitiams while some of their names grew so big, like 肥仔荣 Fatty Weng and 香港珍记 Hong Kong Chun Kee that they were able to own the entire coffeeshops for themselves, while others went on to open their own restaurants. Depending on the culinary background of the 总铺 chong po or head cooks, one could order a wide range of dishes representative of different dialectal communities from these “tze char” stalls, from the more standard dishes like pai guat wong 排骨王, frog legs with ginger and scallion stir-fry 姜葱田鸡腿, braised fish head 红烧鱼头 for communal family dinner eat-outs, or opt for takeaways of one-dish meals like mui fun 烩饭, yuet kwong hor 月光河, fried rice vermicelli “Singapore style” 新州炒米, and of course my favorite 煮炒福建面 Tze Char Hokkien Mee. Mention Singapore hawker fare and many familiar dishes come to mind. 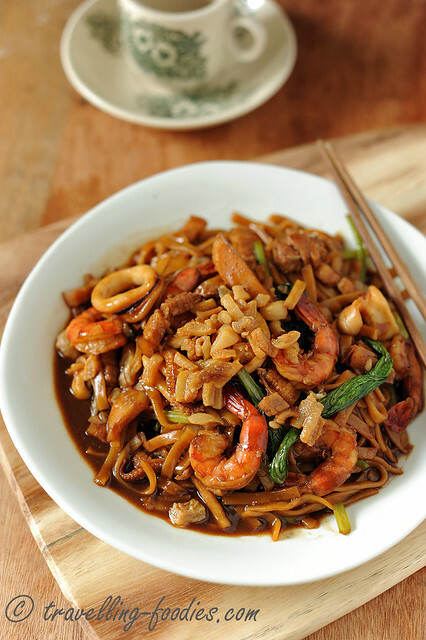 Char Kway Teow, Chye Tow Kueh, Laksa, Bak Chor Mee are just some of the familiar favorites which any true blue Singaporean would be more than glad to indulge in whenever the opportunity avails. 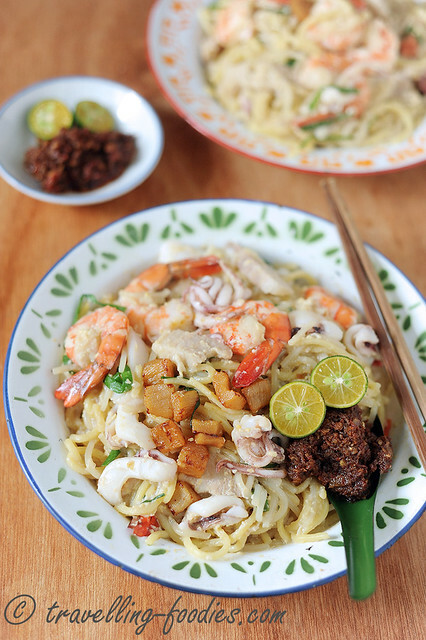 A dish which I truly love and enjoy immensely is Char Hae Mee, which is also known as Fried Hokkien Prawn Noodles. And here is my humble attempt to recreate this much-loved noodle dish at home.